The ulnar is the most exposed of all nerves and ranks second only to the median nerve (carpal tunnel syndrome) as an arm and hand pain generator. Irritation of the ulnar nerve can present as tingling, pain and numbness in the pinky and ring fingers sometimes in a shocking way as the flexed elbow strikes an object compressing it against bone. I’ve discovered about eight ulnar nerve entrapment sites beginning in the neck, extending through the thoracic outlet, armpit, and down into the hand. All those entrapment sites are addressed in my “Treating Trapped Nerves” home-study course, and some examples are presented below. 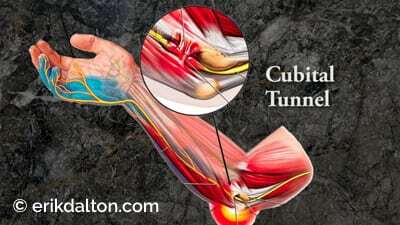 You’ll love how easily these routines integrate into your existing massage and bodywork practice, and your clients will be amazed at how quickly they are free of nagging pinched nerve pain emanating from the neck, thoracic outlet, cubital tunnel, Guyton’s tunnel, carpal tunnel, and sciatic nerve. Slowly repeat 5 to 10 times to gently floss and release entrapped nerve at the thoracic outlet, cubital tunnel, or Guyon’s canal.